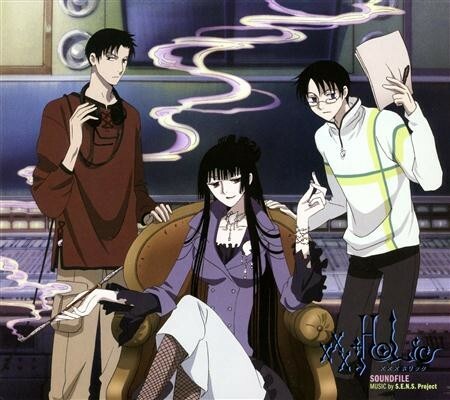 xxxHOLiC Soundfile is the soundtrack both to the xxxHOLiC anime as well as the game xxxHOLiC: Watanuki no Izayoi Sowa. The Playstation 2 game uses over half of the tracks from the anime, but there are also four new tracks written exclusively for the game, with two of them included here on the soundtrack. All of the tracks are written by S.E.N.S., save for the three vocal themes from the anime, each by separate artists. The tracks are mostly very low-key, but S.E.N.S. is able to draw a lot out of simple atmospheres and instrumentation. The album begins with the main theme, “Space & Time ~ prologue”. It begins very atmospherically, then adds some synths making a simple accompaniment. Some sound effects and a bubbling bass fill out the sound, and then the violin finally comes in on the main melody. Although the backing synths are lower quality, it all is able to support the violin which is authentic and really sells the melody, having a great mix of seduction and mystery. It wonderfully represents the source material, setting the mood for the rest of the soundtrack. There are also two other incarnations of the theme. “Space & Time ~ act 2” is a mainly strings version of the theme, not as unique as the prologue, but much moodier with a more sombre atmosphere. The closing “to be continued” version reduces the strings ensemble to a more intimate sound, but it is otherwise similar. Then there are the three vocal themes, each at the cut lengths for the shows, rather than their original full versions. The opening theme “19Sai” is written and performed by Suga Shikao, a popular funk/pop artist. It’s a catchy theme with a great instrumental, falling outside of the typical J-pop opening theme sound. The closing themes “Kagerou” performed by the rock group BUCK-TICK and “Reason” by Fonogenico are a bit generic as a J-Rock and J-Pop track respectively, but they are serviceable and the latter in particular is fairly charming without overdoing it. A good number of the tracks have a very dark atmosphere, and are often quite sparse. Some of them are not particularly remarkable like the two “Mysterious” tracks or “Strange Space”, but they perform their function just fine. The more notable ones include “Shikkoku” with its pulsating bass and building sound throughout, “Curse” with its disorienting effects and shades of the main theme, the Silent Hill-esque “Sounds of the Town” with its strange mechanical sounds, and the ever-shifting “Lethe” with its strange siren sounds and solo violin later on. “Challenge” is the closest to a typically composed track, with clearer melodies amongst the parts, and it builds into something pretty neat. They all still have a distinctive sound that keeps them cohesive with the rest of the soundtrack, and other than a few dull moments they fill it out quite nicely. The soundtrack has a share of light and more quirky tracks for the more playful moments as well. The two “April Fool” tracks have mischievous melodies, and while they start off with a lower quality synths they grow with the addition of other instruments and strengthen, ending quite solidly. “Cho no Michikusa” sports a nice wavy dizziness in its synths in contrast to the firm piano, then the piano does some rising and descending arpeggios to add to the disorienting feel of the piece to match. “Mokona” is the oddest of the bunch, mostly being just glitchy bleeps throughout. “Ayakashi” is much more straightforward with its backbone of pizzicato strings with just a few other elements, being a bit more playful. The lighter tracks include “Nakama” and “Tsuki to Cho”, which brings in some other, warmer instruments into the mix like an acoustic guitar. The latter in particular is quite pleasant. The soundtrack really shines in its more intimate and emotional offerings, which have strong melodies and decent development. Here especially the real instruments shine and hide the lower quality accompaniment. Warm tracks like “Rarity” and “Koigokoro” make good use of a base electric piano alongside other instruments, while “Shizukana no Hibi” and “Zashiki Warashi” have solid piano support to carry the piece, blossoming nicely when the rest comes in. “Small Box” is a nice piece with the melody on a music box, and things take a turn for the more tragic with “Lost Heart” and “Lost Memory”, both with a piano line accompanying a mourning cello and violin on each track respectively. “Deja View” is a beautiful, more meditative track with its repetition that manages to really tug at the heart strings. The two tracks exclusive to the Playstation2 game are similar. The opening theme “Izayoi” and the ending theme “Enishi” both have a great performances from a solo wind instrument against a more upbeat instrumental, though the latter is a bit more sombre and bittersweet. These tracks are all very solid, and its nice that S.E.N.S. takes care to allow the tracks to develop and progress as they go as well, rather than keeping them homogenous or as short loops. xxxHOLiC Soundfile is a great soundtrack for both the anime and the game. The anime’s vocal themes are enjoyable, and S.E.N.S.’s atmospheric tracks are effective. Although they veer on the lower quality side with the synthetic instruments at times, the real instruments used more than make up for it, being played lyrically and emotionally. The score does a great job of encapsulating the various emotions and tones that run through the series and game, and S.E.N.S. rarely lets the tracks drag on too long, building them up and stripping them down when called for. It’s a shame that the other two exclusive tracks from game are not included, but the opening and ending themes are great and they fit in with the other tracks well. This soundtrack will certainly satisfy those who enjoyed any incarnation of the xxxHOLiC series, but even on its own its a solid disc of instrumental and atmospheric music. Posted on December 16, 2015 by Christopher Huynh. Last modified on December 16, 2015.